I kiss him, choosing love over honesty, which is a choice nobody should ever have to make…"
Robin loves sweet, responsible Nick, with his penchant for Beethoven and Ben Folds Five. But she also still loves her college boyfriend Jed, an irreverent playwright plagued with cystic fibrosis. Now Robin is struggling to reveal her secrets and confront her past, as she finally performs in the play that Jed wrote for her, eleven years ago. Will Robin have the strength to keep her promise and stay true to her heart? Alternating between present-day scenes, college flashbacks, and segments from Jed’s play, this tear-jerking yet uplifting tale illustrates how life is finite but love is infinite, and the road to recovery begins with the next breath. I don't think I've ever read anything quite like The Next Breath. It was a truly inventive and unique story, and one that I'll never forget. 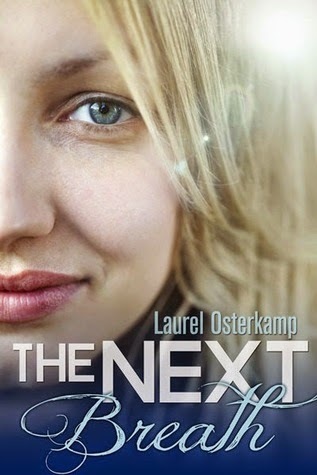 I have been a fan of Laurel Osterkamp for a while now, and The Next Breath just reinforces why I like her books so much. The Next Breath is Robin's story of finding love in college, the kind of love that changes your life. Osterkamp alternates between past and present day---I love that style of storytelling because it's like reading two stories in one book. Robin as an adult, years after her great love with Jed, is trying to fully commit her heart to Nick. Yet, something holds her back, and she discovers what that is in The Next Breath. I really liked Robin---she was loyal, loving and kind---and I really wanted her to find happiness. The Next Breath is full of beautifully written emotions. It was such a moving read! I found myself tearing up several times, and full out cried twice. I love the way Osterkamp wrote the relationships in this story. It was perfectly done, and she surprised me several times with her plot twists. I love it when authors surprise me! What made this story such an emotional read for me is that it features Jed, who has cystic fibrosis, as one of the main characters. I have several chronic illnesses, which have been life-long for me, and know all too well the pain and misery of incurable disease. It's especially difficult to be different from your peers at a young age, like Jed is. Reading about Jed's struggles and the way Robin endlessly supports him was so emotional for me. Osterkamp portrayed Jed's life so perfectly, and he was the most realistic blend of stoic, bravery, and strength in the face of his health struggles. Just these elements alone would have made for a great read. But Osterkamp took the story one step further and added some magical realism within Jed's play. Jed writes his play as his goodbye to Robin, and it was so poetically beautiful and heart-wrenching to read. I loved the inclusion of the play in this story, and the meaning it had for Robin's life. I was surprised and happy with the ending. It was perfect for the story, and it left me feeling happy for Robin, yet still full of gravitas regarding Jed's life. I loved The Next Breath and highly recommend it!